No amount of particulates, whether coarse, fine or ultrafine, in air is safe to breathe. Particulates entering the lungs, depending on extent, can be life-threatening; regardless of concentration, these are health and life impacting if not health- and life-limiting. In understanding this, it is perplexing that school buses powered by diesel engines are still utilized to transport students to and from school, between schools and to other venues (as is done on field trips) and back. And, whether on a so-called clean- or dirty-diesel school bus, as long as particulates are emitted into air from said bus exhaust and there exists the potential for students on said buses to breathe these in, regardless, students riding these are still being exposed to the dangerous, unsafe pollutants. So, my first question is why such a situation is allowed to exist at all. Okay, so I’m thinking of possible reasons for this, one of these being related to purchase costs of diesel-engine-powered versus battery electric and/or fuel-cell electric buses. Battery electric and fuel-cell buses are both designated as zero-emissions vehicles or ZEVs. If anything, the cost for school buses producing zero emissions as opposed to those putting out particulates and other harmful pollutants, over the long run, should be less, all else being equal despite the ZEV bus’ higher purchase cost. Operations and maintenance costs for ZEV buses, meanwhile, are lower. One must also consider longevity. Electric buses should be able to operate for many more years than conventional internal-combustion-engine-powered buses. Therefore, one is able to get more usage from a ZEV bus. Next, there are costs pertaining to fuel. And, the amount that is shelled out for fuel is also important. So, when considering price per gallon of fuel, what is the price for diesel compared to what would be a comparable amount of electrons required to generate the electricity needed for the same amount of ground or driving distance covered? Further, what about the costs for diesel-engine maintenance versus that applied to replacing electric vehicle batteries? Since today’s batteries are maintenance-free, there should be zero maintenance costs and only if and when batteries need replacing will there be an incurred cost for that. 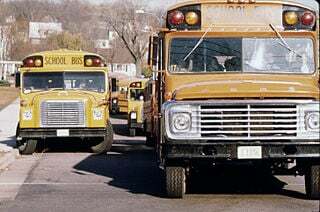 So, to sum, over the long-term, zero-emissions school buses should be less costly to fuel, operate and maintain than their diesel-engine-equipped counterparts. Now, as to refueling, let’s see what’s involved here. In the case of diesel-powered buses, what we’re talking about is the amount of time it takes to remove the fuel-tank filler cap, lift the fuel-dispenser nozzle from the pump holder, place it into the fuel-tank-filler neck, turn on the dispenser pump, dispense the fuel into the tank, remove the nozzle from the filler neck and return to the dispenser pump holder, and cap the filler neck or pipe. Ordinarily, only a matter of minutes is all this process takes. On the other hand, when it comes to battery recharging, without going into the same kind of detail regarding all the involved steps, such a process could consume hours depending upon the amount of charge or hydrogen (in the case of fuel cells) needed to replenish supplies, not to mention the recharging rate capability of the charger during recharging. It is important to note that some infrastructure allows for fast charging while other types might only provide for slow charging, relatively speaking, that is. But, wait a minute. School buses for all intents and purposes aren’t operated continuously throughout the day – only during mornings and late afternoons. So, to meet the morning demand, electric bus batteries could be recharged overnight as might also be the case for fuel-cell refueling. And, after said buses fulfill their morning obligations, during down or idle time between morning and afternoon use, those buses could be recharged/refueled again. This would help ensure that said buses have sufficient supply to amply perform the service that is required of them. Okay, so I get the part that school districts would need to invest in the hardware necessary to recharge/refuel on premises and, this, of course, would mean some additional capital outlay. That said, though, I know that for students riding in school buses their safety is a top priority. Not just their safety but student (and driver) health should be a top priority too. And, this is why I encourage the use of zero-emissions school buses over those that emit particulates and other harmful pollutants. Without question, for school, ZEV buses rule. FYI: Today is the last day of Air Quality Awareness Week for 2018. Image above: David Rees, U.S. EPA, catalogued and held by U.S. National Archives and Records Admin. Thank-you for bringing the serious issue of diesel bus exhaust to our attention. This is a disgusting way to treat our children, and is among the greatest travesties of the 20th and 21st centuries. As humans, we were supposed to stop people being lined up to get gassed at the end of WW2. Instead, since then, more people have been killed by air pollution than in all of the world wars combined!